Well it’s been a long time – and a lot of hard work – in the making, but last weekend saw the return of the annual BRISLA Awards, and this year the show was even bigger and better than last time. 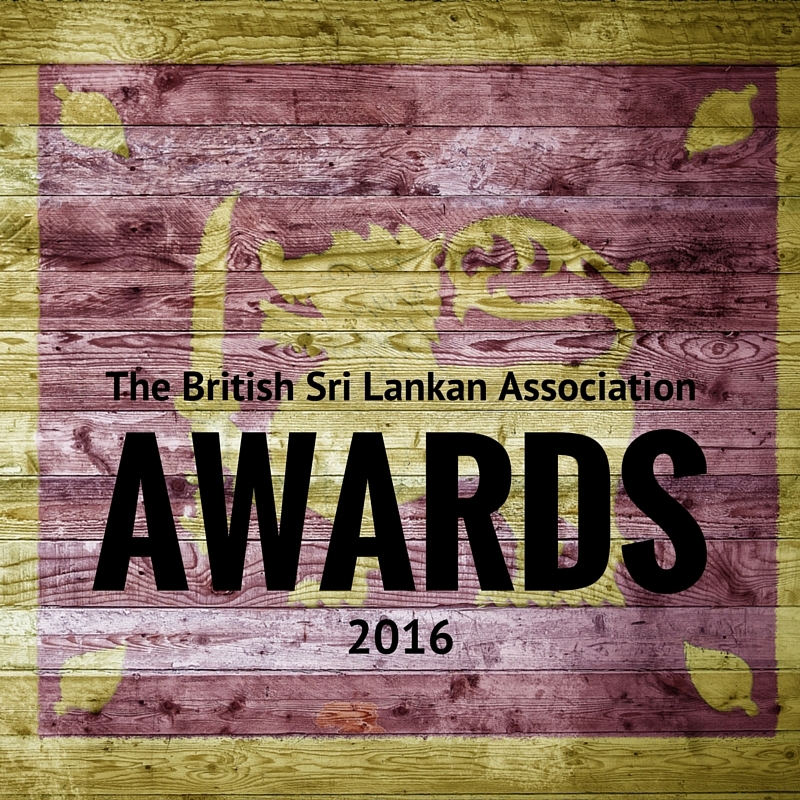 After an incredibly successful inaugural year, Saturday 8th October 2016 saw the return of these incredibly popular awards, hosted by The British Sri Lankan Association at the world famous Lord’s Cricket Ground. 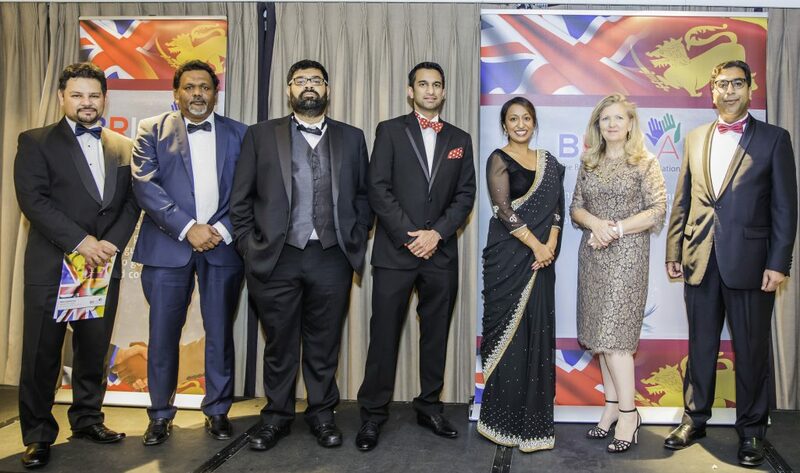 With over 150 people in attendance, the awards witnessed the cream of the British Sri Lankan community come together to celebrate the exceptional achievements of the previous twelve months, and enjoy an evening of sparkling hospitality with inspiring guests. BRISLA Executive Committee with Mrs Lynn Stanier. 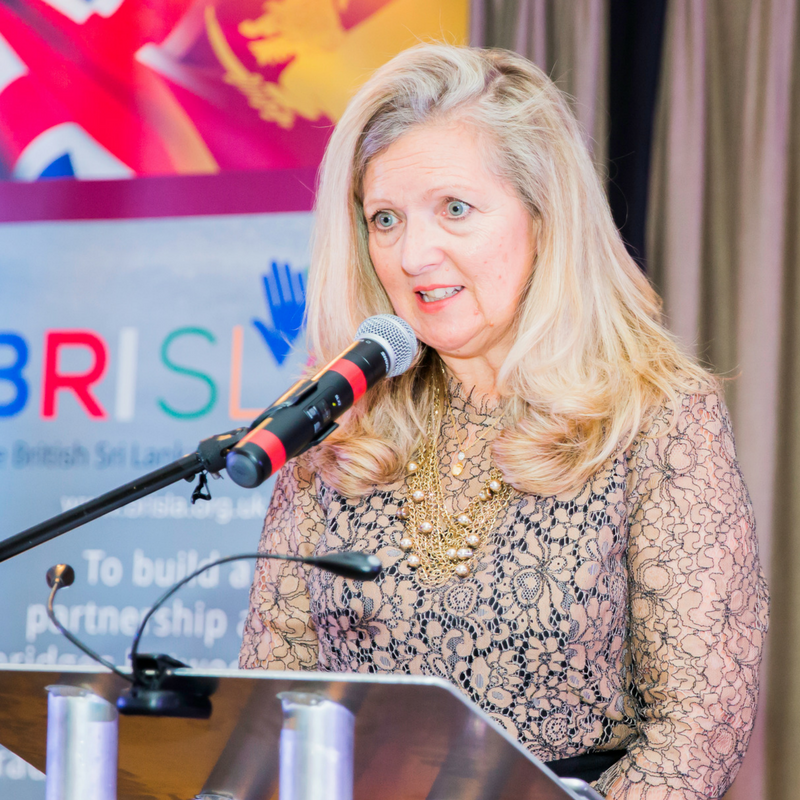 Conceived by the British Sri Lankan Association’s Executive Committee, the BRISLA Awards were set up with the simple goal of rewarding and celebrating the brilliant achievements of those working to improve the lives of people in both Britain and Sri Lanka. Every day, businesses, charities and individuals are working tirelessly to improve our two great societies but, more often than not, their efforts are going unacknowledged and unrewarded. BRISLA’s Executive Committee recognised the error in this and also realised that, if excellence is to be repeated and replicated, it must be acknowledged and rewarded. 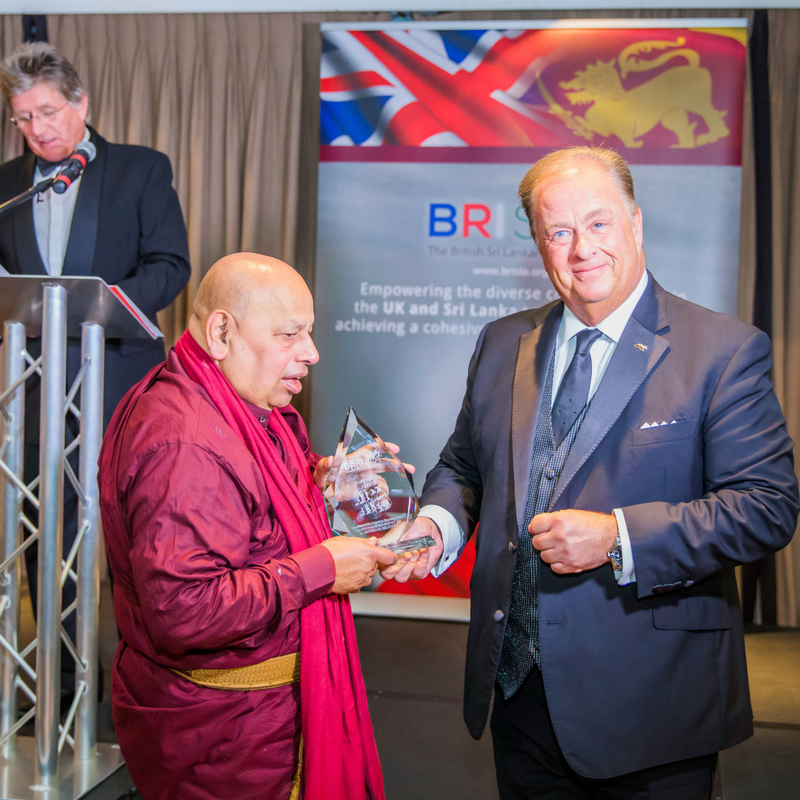 Hence, the BRISLA Awards were born, with the fundamental idea that no worthy action taken to improve British or Sri Lankan society should ever be undervalued. 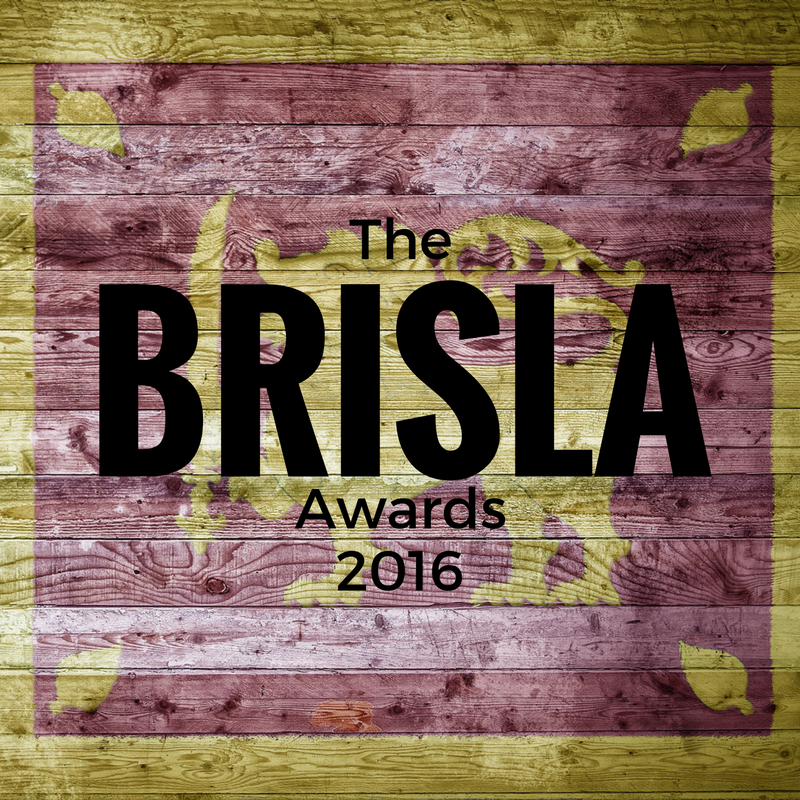 Thus, in October 2015, the inaugural BRISLA Awards were held at St Paul’s Grange Hotel in London with some very special guests, and the event was an immediate success; so much so that the BRISLA Committee were a little anxious about repeating the accomplishment for a second time! Fortunately, there was no need to worry, as the second annual BRISLA were just as spectacular as the first. This time held at the world renowned Lord’s Cricket Ground in London, the 2016 BRISLA Awards were once again hosted by BRISLA’s Chairman and President Dr Zimar Sivardeen, but also included some very special guest speakers. 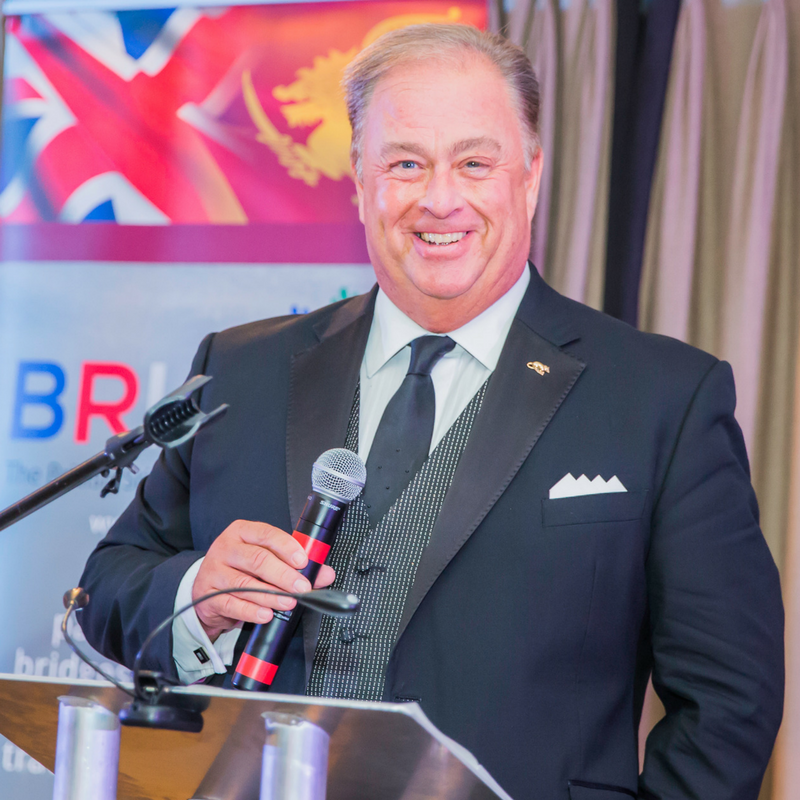 Steven Elworthy is a former South African Cricketer who, since 2010, has been the Director of Marketing and Communications for the England and Wales Cricket Board. In his international career, Steve played a total of four Tests and 39 One Day Internationals for South Africa between 1998 and 2002, yet he also played English Country Cricket for Lancashire and Nottinghamshire, as well as playing for Hinckley Town, Rishton and Flowery Field. 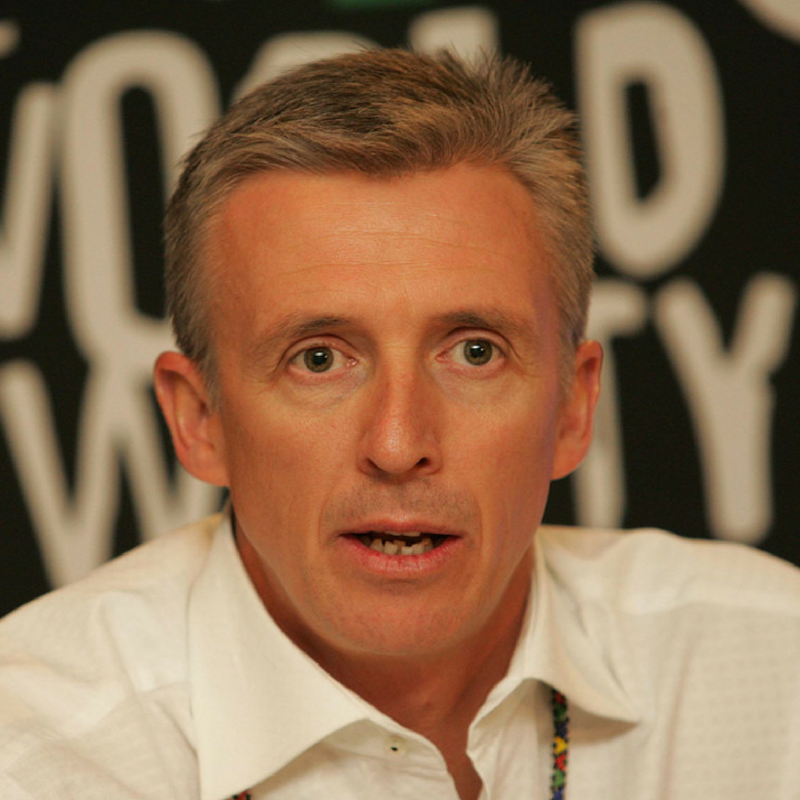 Since his retirement from professional cricket, Steve Elworthy has forged a career as a successful cricket administrator, initially as Cricket South Africa’s Commercial and Communications Manager, then as Tournament Director for the inaugural Twenty20 World Championship in South Africa in 2007, before taking up his current position at the England and Wales Cricket Board. BRISLA were incredibly honoured that Mr Elworthy was able to join us for the BRISLA Awards and his motivating speech was a pleasure to hear. Similarly inspiring was our second guest, Sir Michael Wilshaw, who is Her Majesty’s Chief Inspector of Education, Children’s Services and Skills at OFSTED. Having spent his career as a teacher and head teacher in various London schools, Michael Wilshaw was bestowed with a knighthood in the 2000 New Year’s Honours List for services to education. Sir. Michael Wilshaw, Head of OFSTED. In 2012, Sir Michael Wilshaw was announced as the successor to Christine Gilbert as the Chief Inspector at Ofsted, a position he will hold for the stipulated five-year term, and where he has firm plans to improve the Ofsted ratings of all Britain’s schools. 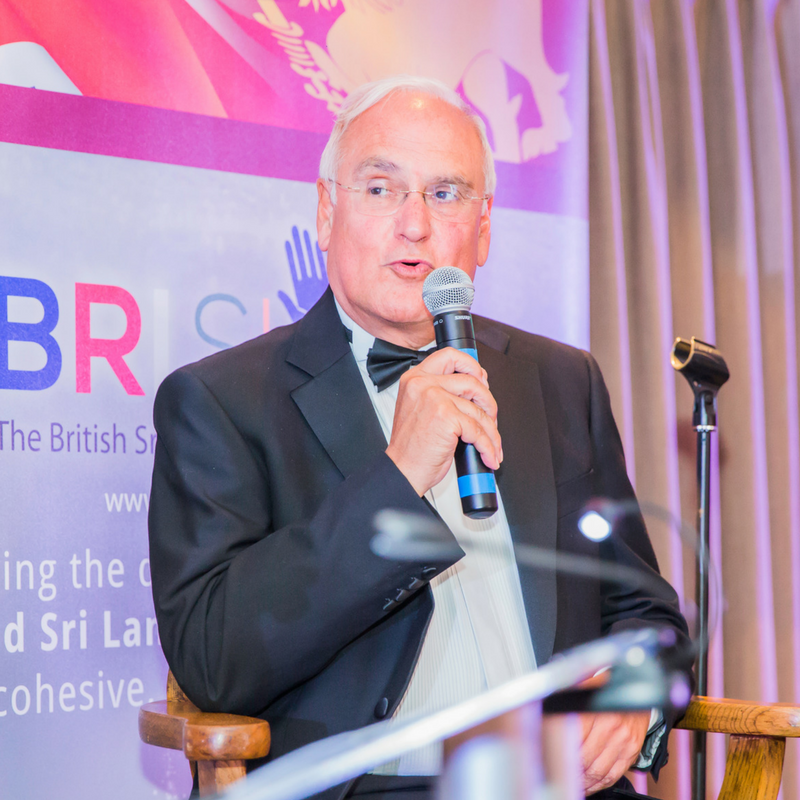 Again, BRISLA were honoured to receive Sir Michael at the 2016 BRISLA Awards and everyone present found his speech edifying and encouraging, plus the Q&A session was much enjoyed by all and revealed the international links that both Sir Michael Wilshaw and Steven Elworthy have with Sri Lanka. But just as important and welcome as our guests of honour were those very special guests who were with us thanks to their nomination for a BRISLA Award. 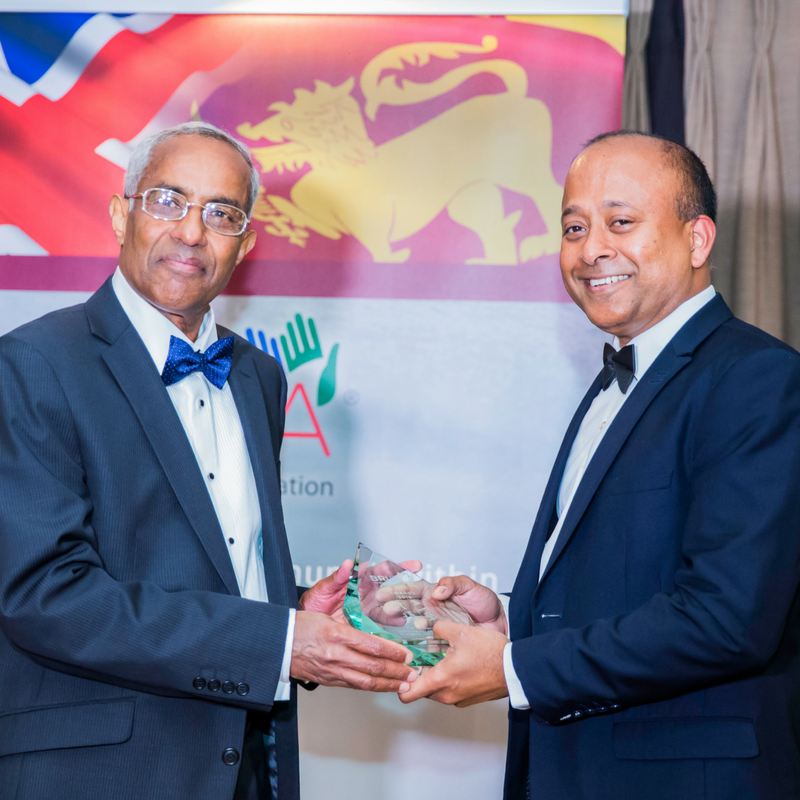 The seven categories of the BRISLA Awards were drawn up to reflect the goals and mission statement of the British Sri Lankan Association as a whole. The not-for-profit organisation was formed to eradicate poverty, improve education and health, and promote environmental awareness within both Sri Lanka and Britain, which it does through its charitable works. BRISLA relies heavily on the dedicated and selfless work of the many people who give up their time for free to help further the aims of the society, and in addition to recognising excellence, the BRISLA Awards event was a great opportunity for BRISLA to say thank you. Dr. Zimar Sivardeen speaking to TV Channel presenter. 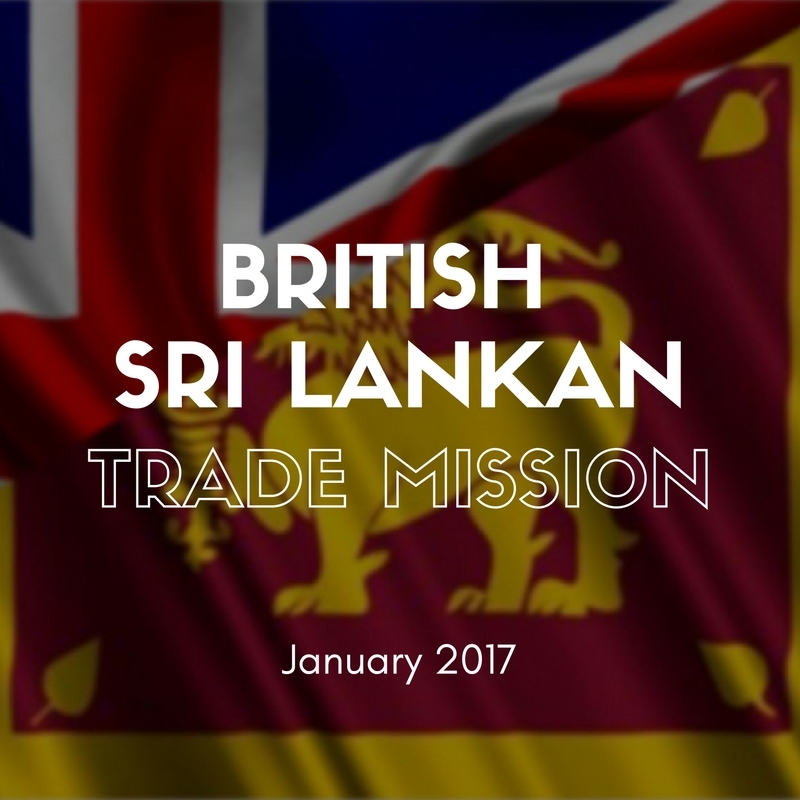 “The relationship between the UK and Sri Lanka is characterized by traditional warmth and cordiality, based on common interests, shared history and cultural traditions. In the UK, we are complimented by the presence of over 200,000 people with Sri Lankan ethnicities. The British Sri Lankans have excelled in various areas of social and economic life forming a living bridge between the two countries. Of course, the main event of the evening was the BRISLA Awards themselves. This year, BRISLA received so many admirable nominations in each category that choosing a winner was an incredibly tough choice; every single nomination was worthy of recognition for the outstanding achievements made over the last twelve months. 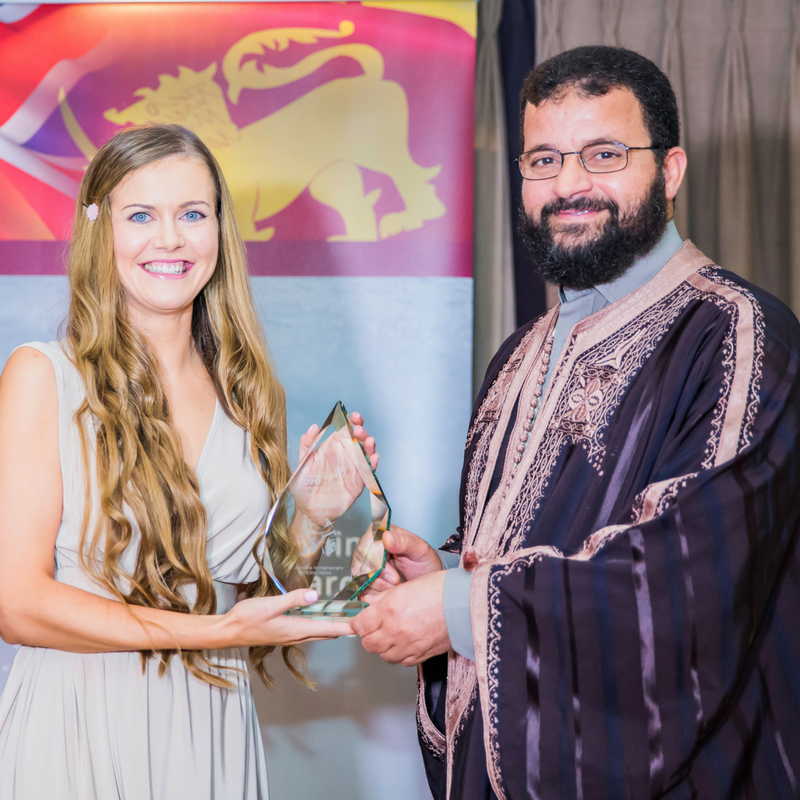 Mr. Muhammed Ali, CEO of the Islam Channel, presenting to Ms Victoria Hatton, on behalf of Mr Chandana Wickramasinghe. An acclaimed dancer and founder of the Dancers’ Guild, Mr Chandana Wickramasinghe has outstanding choreography, rhythm, style and character. Though a traditionally trained Kandyan dancer, Chandana has brought innovations to the dance form, integrating it with modern beats, a bit of folk and a combination of classical and traditional interventions. Mr Steve Elworthy presenting to Mr Saravanamuthu Mylvaganam MBE. 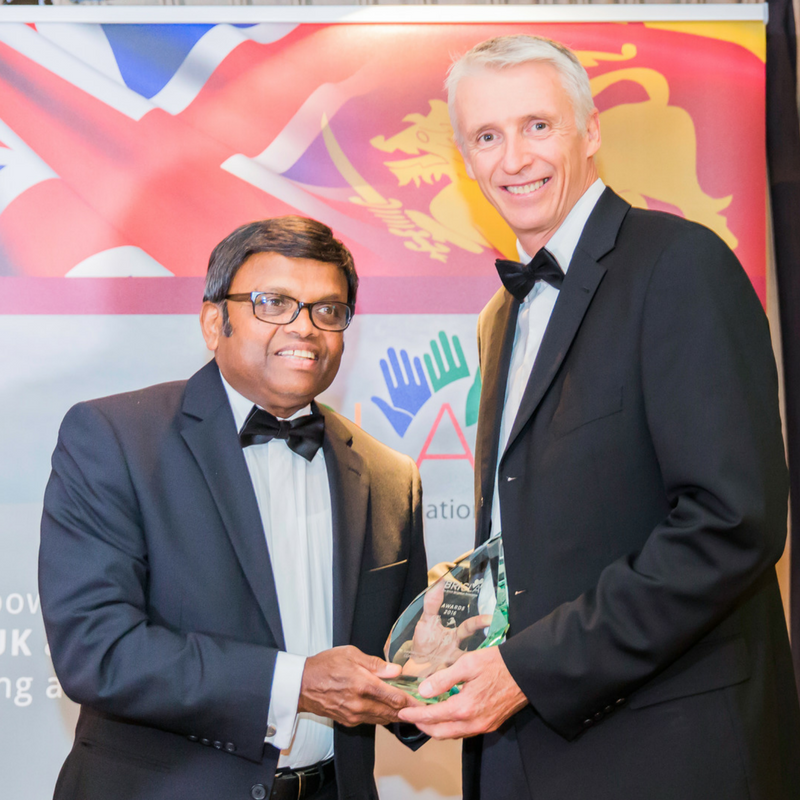 A talented professional cricketer, Mr Saravanamuthu Mylvaganam has used his experience and coaching skills together with his passion for the game to help train and organise sporting events in the UK. He was rewarded with the prestigious MBE award in the New Year Honours List 2016 for his outstanding public services to the community. Mr Ian Richards presenting to Venerable Galayaye Piyadassi MBE. Venerable Galayaye Piyadassi MBE is the first ever Buddhist monk to be honoured by Her Majesty The Queen for community services to Britain. He has also been awarded The Citizenship Award from the Mayor of Brent. His hospitality, kindness and enchanting personality have helped hundreds of destitute Sri Lankans in London with practical help and advice, and board and lodgings in a characteristic Buddhist temple. He is involved in promoting multi faith interactions in the UK and organises the well-established Sri Lankan New Year Festival in Harrow for the diverse communities present in London. 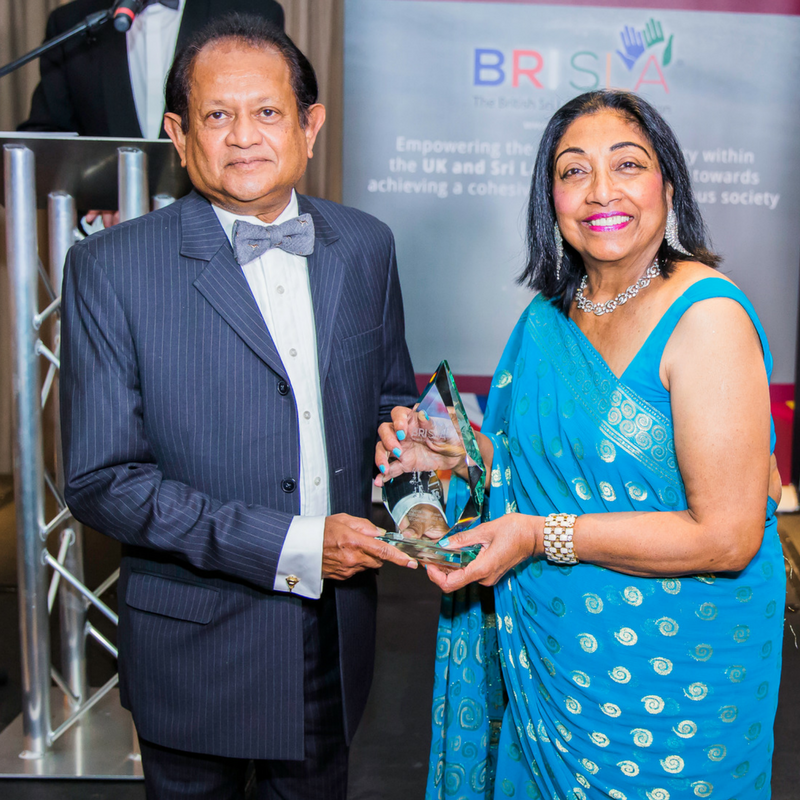 Ms Charmaine Jayatilleke MBE presenting to Dr Ananda Thevathasan. Dr Ananda Thevathasan is an ardent and passionate contributor to, and organiser of, many charity events. He is a proud Founding Member of “Oru Paanai”, an organisation geared towards feeding hungry children in Sri Lanka. With only 7 doctors, the organisation has managed to feed as many as 40,000 children to date. His caring nature and ethos of hard work has no doubt also contributed to his success in the BRISLA Awards. 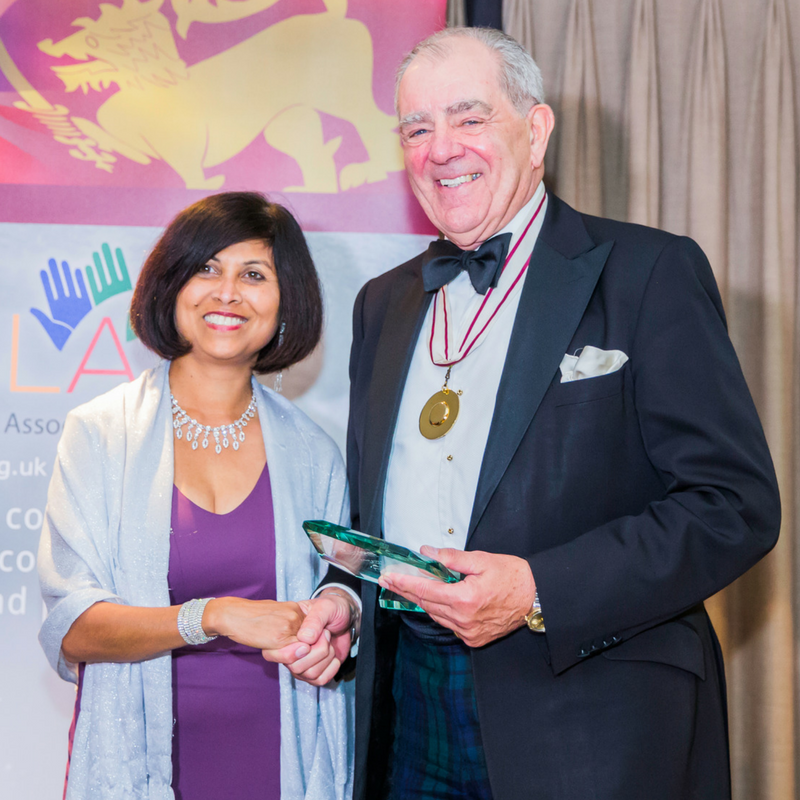 Colonel Geoffrey Godbold, Deputy Lord Lieutenant, presenting to Mrs Ajantha Tenakoon on behalf of Aswini Weeratne QC. Having taken Silk in 2015, Aswini Weeraratne QC is one of the very few female practising QCs of Sri Lankan descent. Aswini has a reputation for cutting through to the heart of complex cases and turning around large volumes of work in short periods of time. She applies her skills to a wide range of practice areas in contentious and non-contentious matters, and is an acknowledged expert in human rights, mental health and capacity law. Her particular specialism is the protection of vulnerable adults and young people in many different spheres of life. 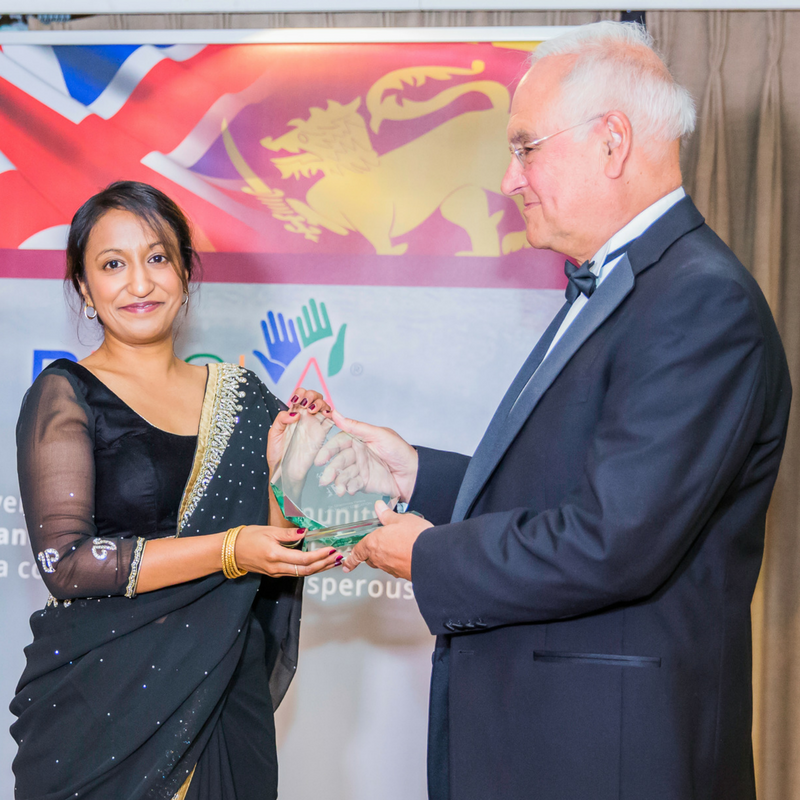 Sir Michael Wilshaw presenting to Dr Shirani Rajapaksa on behalf of Dr Dhammika Perera. Dr Dhammika Perera is the Global Medical Director of Marie Stopes, based at their HQ in London. 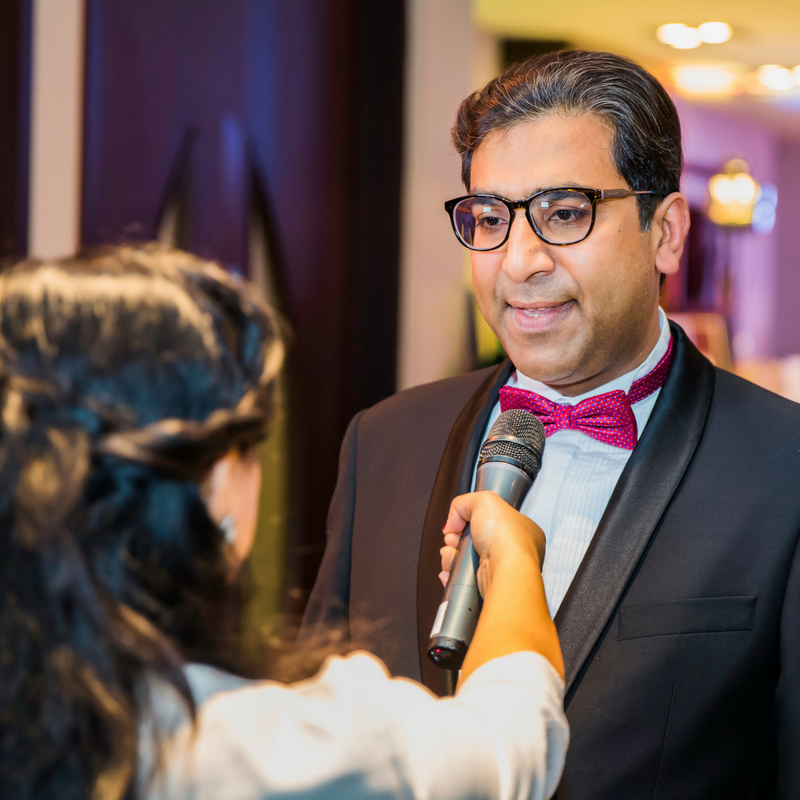 Dhammika is a champion for women’s causes, specifically surrounding reproductive health, and has held vital positions in Medicines Sans Frontieres, International Rescue Committee and the Sri Lankan Ministry of Health. Mr Manoj Warnapala, Sri Lankan High Commission, presenting to Prof. I.M. Dharmadasa. Prof. I. M. Dharmadasa is renowned for his work in the promotion of clean energy technologies for social development and the reduction of poverty. Dharme first established, and now leads, an International Renewable Energy Promotional network (SAREP), which aims to accelerate the adoption of renewable energy technologies. He has designed, piloted and monitored the “Solar Village” project, which is now in the replication stage both within and outside Sri Lanka. Each one of our Awards winners has done exceptional work over the last year that has merited such recognition, and the BRISLA Executive Committee were exceedingly humbled by their achievements. We wish all of our winners well for the next twelve months, and hope to see them again at the next Awards! Following the speeches, awards and the Q&A session – plus the delicious food – the spectacular evening was brought to a close with a riotous performance by the comedian Mr. Ian Richards, AKA King Rat 2016, of the Grand Order of Water Rats. And in addition to all the other good work achieved on the night, the event raised a grand total of over £2000 for Their Future Today, a local charity who aims to return basic human rights to every forgotten child, including their right to a home, an education and a life, by reuniting families in Sri Lanka. Mrs. Lynn Stanier, CEO of Their Future Today. All in all, it was a thoroughly delightful evening that was enjoyed by all, and we can’t wait to do it all again in 2017! If you’d like to find out more about the BRISLA Awards or any of the people involved in it, then you can contact BRISLA directly via the Contact Page on the website.